We are organising the Western Cape’s first and only festival dedicated purely to spoken word. 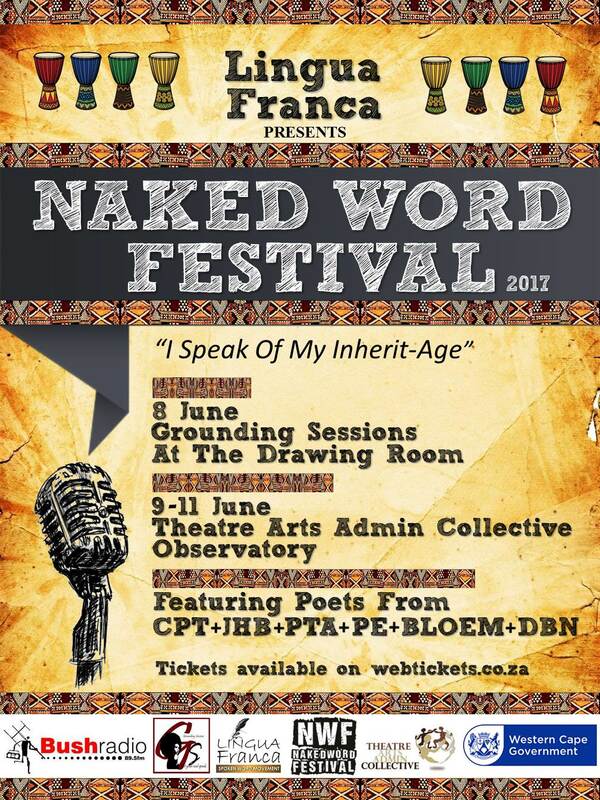 The Naked Word Festival will serve as an affirmation, a declaration and an exploration of the future of a distinctly South African poetry. This festival will celebrate a new century of spoken word poets actively redefining South African literature, in both its oral and written forms, by highlighting young poets from different cities, backgrounds and cultures who are pushing the boundaries towards a new language, sound and aesthetic that expresses and reflects our current realities, struggles, and bare truths. In stripping away any and all adornments and superficiality, the Naked Word Festival will seek to uncover and rediscover contemporary South Africa poetry in its most raw and essence. 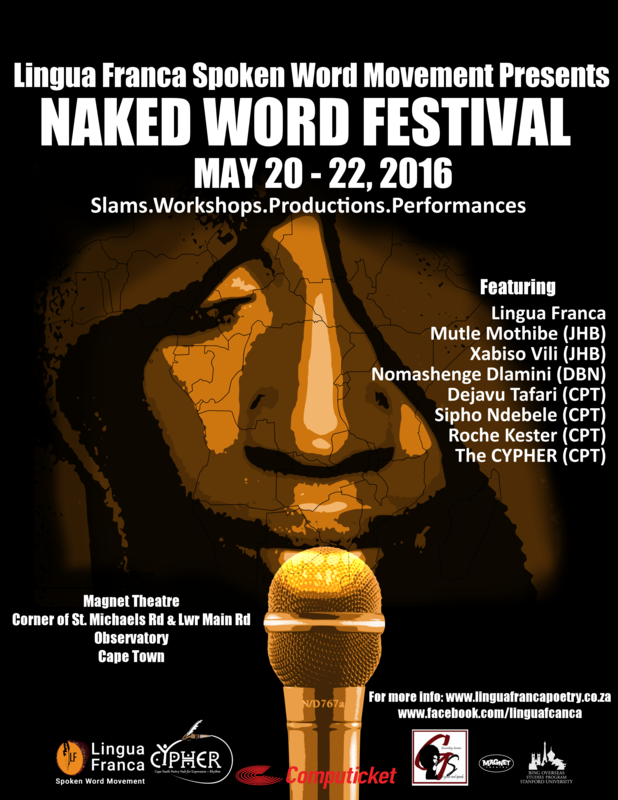 The Naked Word Festival officially opens on the 20th May, but includes a teaser on the 19th with a collaboration with existing weekly poetry platform, Grounding Sessions, which will feature Mutle Mothibe and Nomashenge Dlamini along with an open mic. Festival attendees will see performances by a range of top local and national artists, including the widely-celebrated Johannesburg-based poets, Mutle Mothibe and Xabiso Vili, who have gained critical prominence in the national poetry scene, as well as Durban-based, Nomashenge Dlamini. Also featuring are the Cape Town-based heavy-hitters, Khanyiso Mabodla, Dejavu Tafari, Sipho Ndebele, and Roche Kester. The festival will also showcase the Cape Youth Poetry Hub for Expression & Rhythm (CYPHER), a collective of youth poets (ages 15-20) who are currently marking a new chapter in South African poetry. 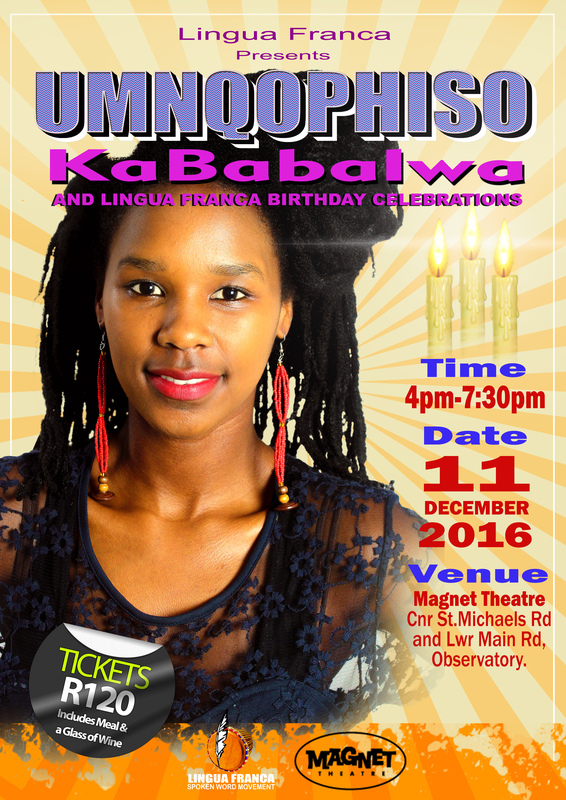 With great honour, Lingua Franca will perform and serve as the host band at the 51th Fleur Du Cape Theatre Awards. The annual Fleur du Cap Theatre Awards will be celebrating with a glamorous red carpet event where you will be spoilt not only with a chance to mingle with celebrities but you will be treated with world class entertainment, delicious food and the finest Fleur du Cap Wines - all included in the ticket price. 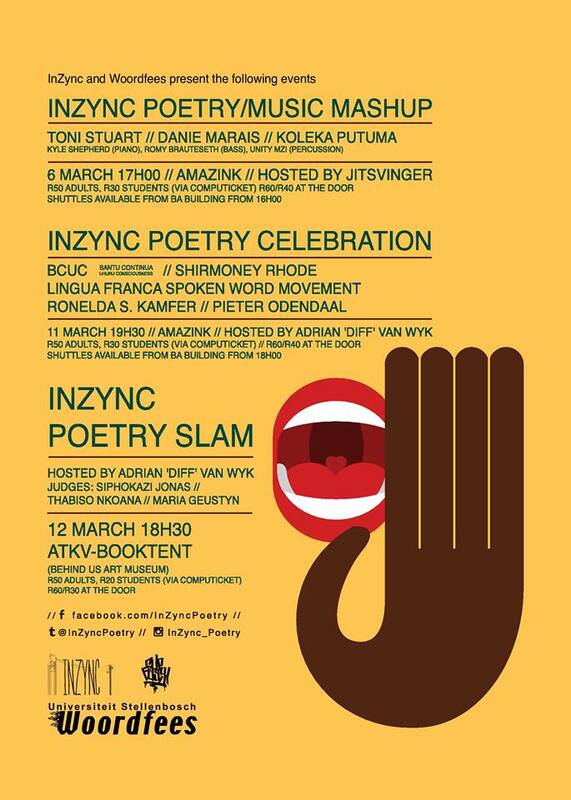 As part of Woodfees 2016, Lingua Franca will perform in the Inzync Poetry Celebration, alongside the BCUC (Bantu Continua Uhuru Consciousness), Shirmoney Rhode, Rondelda S Kamfer, and Pieter Odendaal. 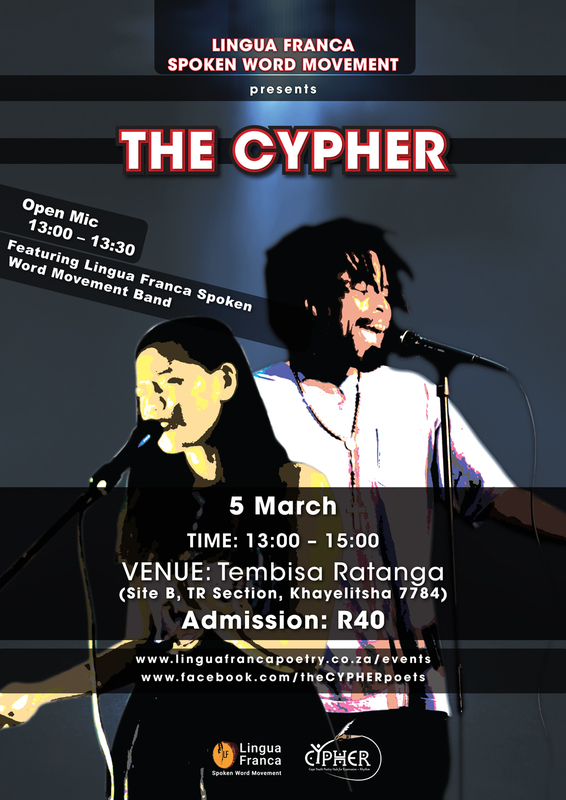 In celebration of youth voices, we proudly present "The CYPHER" (Cape Youth Poetry Hub for Expression & Rhythm), Lingua Franca's new programme for young spoken word artists. 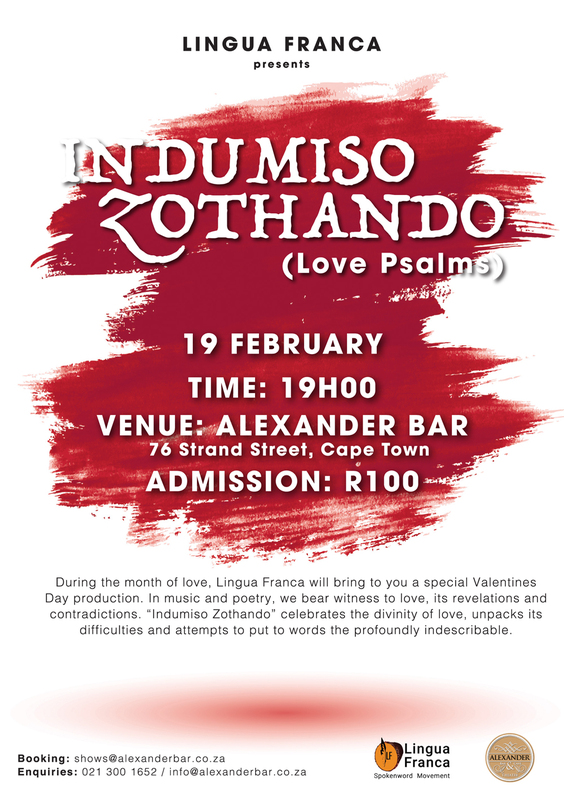 Some of Cape Town's top emerging poets will perform alongside the famed Lingua Franca band in an unforgettable display of the transformative power and potency of youth poetry. Join us in welcoming this next generation of poets! During the month of love, Lingua Franca will bring to you a special Valentines Day production. In music and poetry, we bear witness to love, its revelations and contradictions. 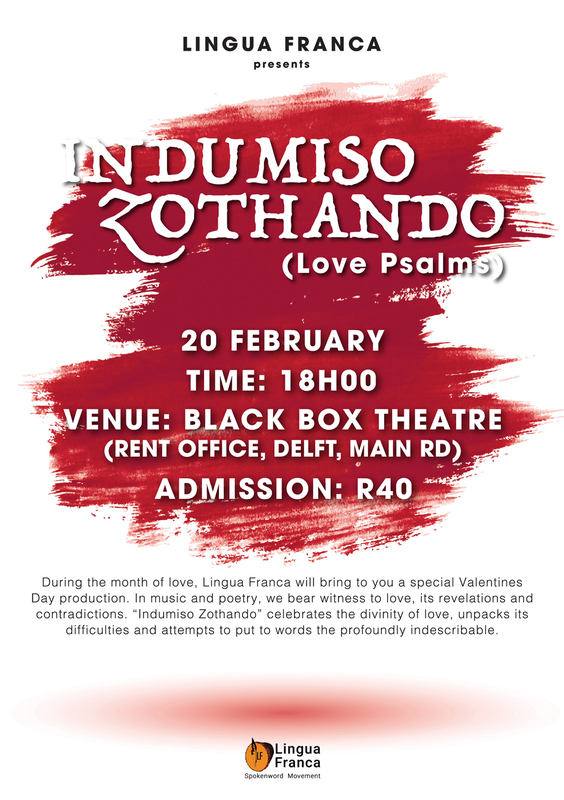 "Indumiso Zothando" celebrates the divinity of love, unpacks its difficulties and attempts to put to words the profoundly indescribable. 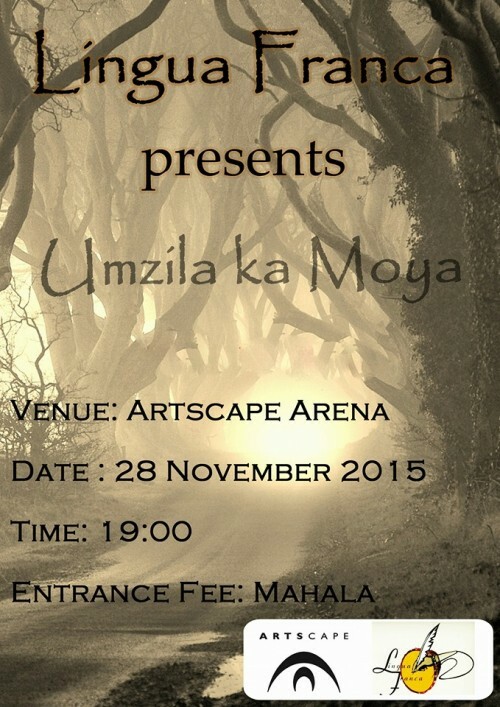 Lingua Franca will showcase “Umzila ka Moya”, a new production that takes audiences on a journey through the complexities, difficulties and beauty underlying identity, heritage, and ancestry. It is an interrogation of the historical contingencies, familial circumstances and social realities that make the ‘clan name’ a site for contestation, celebration, pain, loss, and belonging, all simultaneously. In this production, wounds are both opened and attended to, as we continue on this never-ending journey to (re)define ourselves and understand our origins. This is a challenge to trace the footprints of those who came before us, courageously acknowledging how Western Civilisation led many into identity crises.